The replacement sock for Aircast walkers. This is a replacement for the white cotton/polyester/lycra sock that comes with each Aircast walker to reduce skin irritation while wearing the boot. 22" in Length. Sold as singles. Boot not included. This sock is designed to be worn over the leg as a sleeve to prevent irritation while wearing the Aircast Walker boots. It is not designed to be worn over a plaster cast, it would not stretch enough. Is this for the aircast sp as well? I have a stress fracture in my left foot, 2nd metatarsal. Just started wearing boot today. Looking to make the next 6 weeks as comfortable as possible. You can use the sock with any walking boot. Is this your longest sock ? Yes, you can wash the Aircast Sock Liner. Use a mild detergent, and either hand wash in cool water, or wash on the delicate cycle, then air dry. Is this a true one size fits all? I have large calves. Can the sock be trimmed if it is too long or will it thread? I need replacement tube socks for my Aircast boot. Do they come in pairs or just one sock to a pack? It is a tube sock, made of cotton. I have a torn ligament and have been wearing the boot for 4 weeks. The dr. wants me to get a orthodic but I'm comfortable in the boot. Will it harm me to wear the boot for several months? Wearing the boot for too many month can lead to stiffness in the foot, as well as weakening of them lower leg and foot muscles for inactivity. I would suggest disscussing your concerns with the doctor and see if he can help you develop a new game plan. do these socks wick away moisture as well? The sock is a cotton/polyester/lycra blend. It will wick better than a 100% cotton sock. Hi there, are there any other colours for the sock, perhaps grey or black? Unfortunately there are no other colors for the sock. They only come in white. 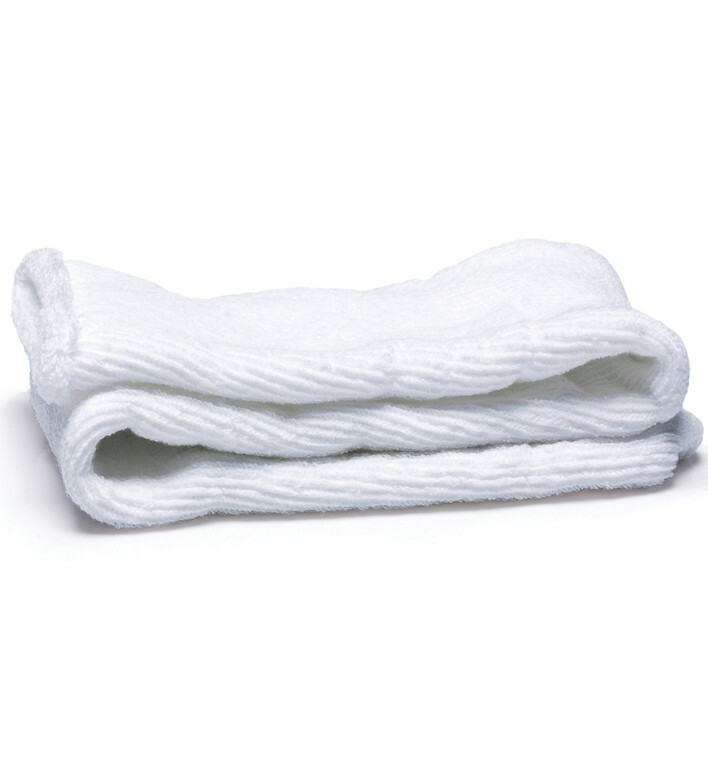 If I order some sock liners how quickly would they be shipped? Are they in stock? Most items are in stock and usually ship the same or next day. I had a stress fracture in 2010 and now another in 2013. I could not find THE SOCK and used another and it was a disaster - so much pain. I just found THE SOCK and what a relief. I am ordering another one today so that I am prepared for anything to do with the aircast. A must have for anyone using an aircast for any length of time. I wear mine for added cushioning and never go without it. In fact, I am ordering another one again! They are exactly the same type as received in the hospital. Pros: Perfect fit and comfort. Cons: Very smelly after wearing for a day. These socks are amazing. It's summer and very hot. The socks wick away moisture from my foot and leg. Anyone in an Aircast should have several on hand! I bought this to go under my aircast walking boot to cushion my ankle. It was the softest, thickest, most comfortable sock I have ever put on over my injured ankle. I love it! I am ordering an extra so I always have a clean fresh one, especially since I will be in my boot for a long time. The sock is so comfortable. Trust me, it makes wearing this aircast so much more comfortable. I ordered these, because I needed to wear the boot in winter and my foot was always cold. They are very warm and comfortable to wear, and they fit in the aircast boot perfectly. Pros: I had surgery on the same foot and ankle earlier last year and could not find anything that fit comfortable and offered a little extra padding inside the boot. These liners were perfect. Cons: They should come in packs of more than just one. These socks are so comfortable and wonderful for wearing in your boot. They wash up nicely and you definitely will need 2 pair as you won't want to be without them! This sock is so comfortable and washes well. I just bought another! !